04/09/2009 Biniax Mobile 1.80 is released. Screen rotation is supported of accelerator-enabled devices. 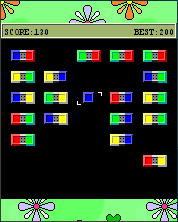 Biniax is unique and addictive arcade/logic game available for most computer platforms. Biniax Mobile allows the players to enjoy the game anytime and anywhere, playing on mobile phone or PDA. - Three versions for MIDP 2.0 (fullscreen), MIDP 1.0 with Nokia UI (fullscreen), MIDP 1.0 generic (windowed). Move your block among the field, taking the pairs with element like yours inside. If you take a pair, your element changes to the complementary block from the pair. Beware of blocking yourself. - Touch-screen - Double-click to choose from the menu. In the game - click the direction you want to move, related to your block. Click outside the game field to go back to the menu. You can download the source code, release under modified zlib license. Biniax games are copyright of Jordan Tuzsuzov.